Since the splash screen and the main form are in two different threads, the correct approach to communicating between them is to use the Invoke() method with a delegate. 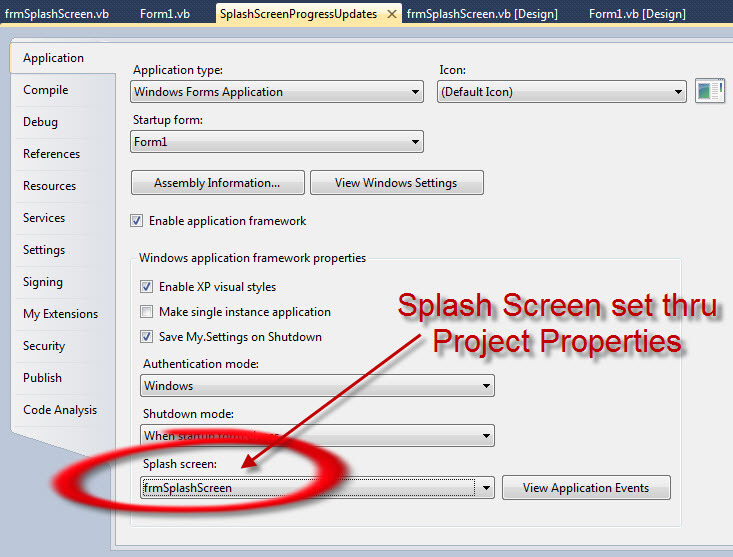 This is covered in the MSDN article, How to: Make Thread-Safe Calls to Windows Forms Controls. Many don't even think to use this approach, though, since cross-thread communication is not normally an issue when dealing with two forms. The splash screen, then, is an exception to the rule! We use InvokeRequired() to determine if the calling thread is different from the thread that created the control. If yes, then we create an instance of the delegate that points to the same exact method. Next we use Invoke() to run the delegate on the thread that created the control and pass the parameters using an array of Object. This actually results in a recursive call since the delegate points to the same method. On the second run InvokeRequired() will return false and the Else block will execute where the control can be safely updated. Note that I'm using "Me" instead of a control name to check for InvokeRequired(). The "Me" in this case represents the Form itself and is valid since Forms also Inherit from Control. All controls run in the same thread as the form that contains them so this is a clean and safe method of checking. 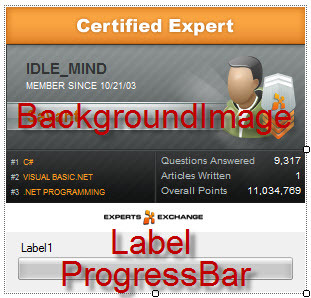 Also note that in the Else block I am updating both the Label and the ProgressBar at the same time. You don't need a separate method with an accompanying delegate for every control; just check against the form and update all controls at once. The delegate being used receives both parameters and the Object array contains both parameters passed to the method. The Splash Screen in Action! This article hasn't really introduced anything new or mind blowing...it just puts two and two together to accomplish something that really should be much simpler!